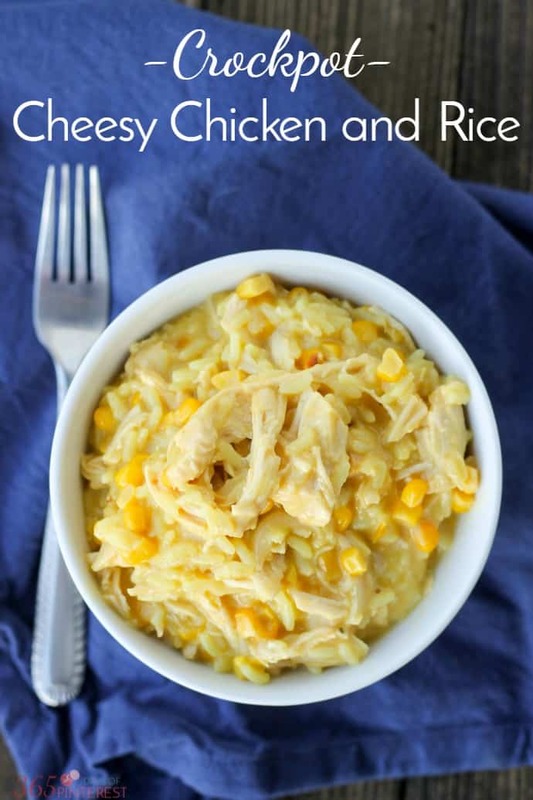 This Cheesy Chicken and Rice is made in the slow cooker and makes fantastic leftovers for lunch the next day! 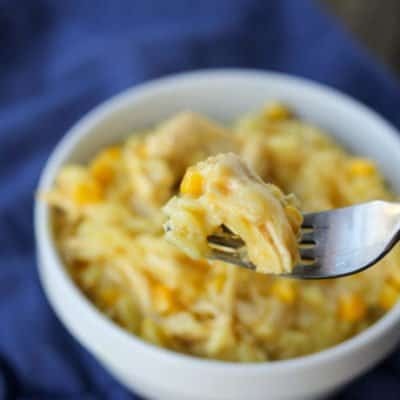 OK, so this tasty chicken and rice may not be the most healthy and low-calorie thing you’ve ever eaten, but I guarantee it’s still better than hitting the drive-thru on the way home. I put this in the slow cooker on Sunday morning and came home to a delicious, stick-to-your-ribs lunch. I wasn’t a huge fan of the idea of having to cook the rice separately, especially because we are always ravenous by the time we get home from church. To solve that problem, I just made it ahead of time and when we got home, I pulled it out of the fridge and tossed it in with the cheese and corn. It was ready to go in just about 10 minutes, so not bad. 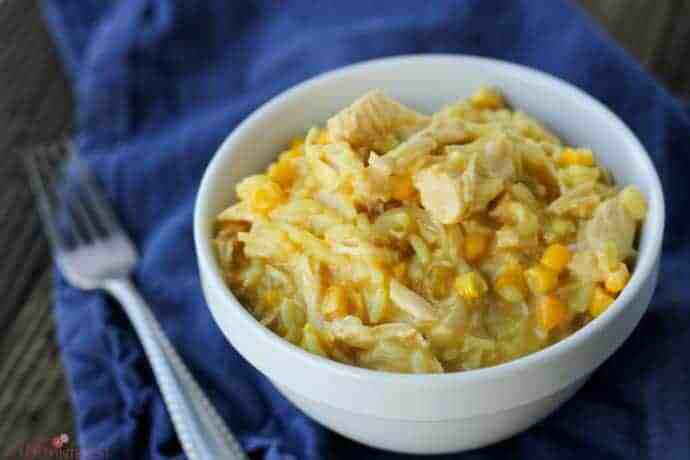 When I’m making this on a day that I’m home, I just cook the rice 30 minutes before we’re ready to eat and stir it in just before serving. Because it’s such a heavy meal, you’ll want to lighten it up by serving a nice crunchy salad on the side. I used Romaine lettuce for mine and it was a tasty combo. Scatter chopped onion over top. Spoon cream soup over top of that. Cover and cook on low 4-5 hours. A few minutes before serving, add in cooked rice, corn, and cheese. Stir to combine. Serve hot. 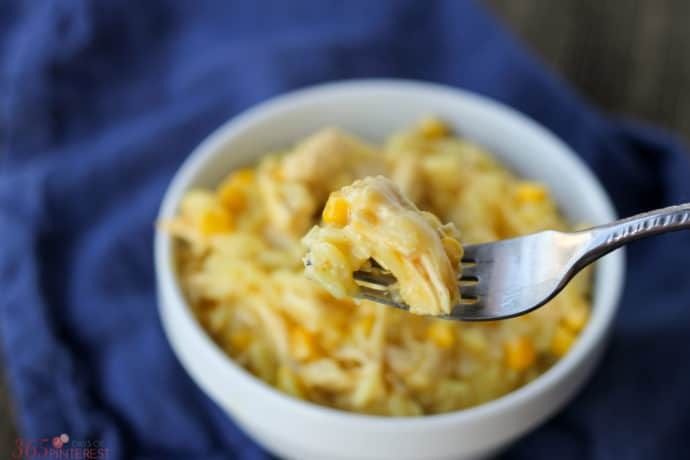 Click here for more Crockpot recipes like this Cheesy Chicken and Rice! How many servings does this yield? And on another note I am really excited to make this, it looks so good! Do you thaw the chicken or can it be put in frozen? Thanks! This looks so good! Quick question: do you place chicken in cooked or raw? This was so good!!! My whole family loved it! I had to double the recipe for my family of 7, but everyone loved it. I’m so glad you liked it! 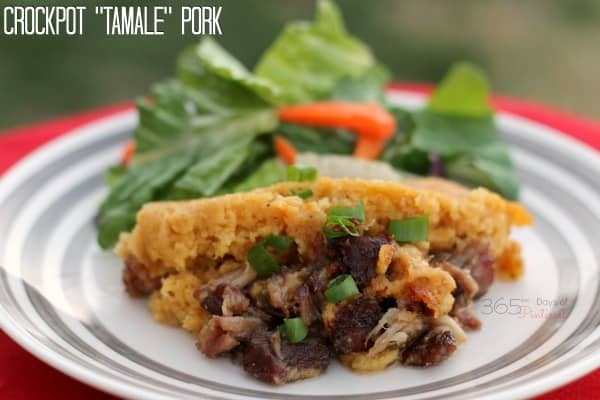 It’s such a hearty dish- perfect for Fall and Winter! This looks delicious! I want to try this one out soon.